Roll to Roll Coater/Dryer RT-700F /RT-T700F | SCREEN Finetech Solutions Co., Ltd. The technology of high-precision slit coating system, the No.1 coater for TFT arrays for LCD worldwide, has been adopted to electrode coater. 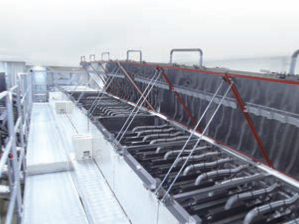 What's more, the drying system features high speed drying process while preventing migrations. The coater/dryer is suitable for production of high-spec. rechargeable Lithium-ion battery (LiB) for electric vehicles. The coating thickness can be finely adjusted simply by inputting the angle of the nozzle and gap between the nozzle and base material via the operation panel. 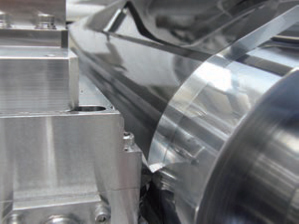 This ensures a uniform coating thickness regardless of the skill of the operator. Circulation of coating material, including that inside the nozzle, continues during standby. This reduces unevenness and coating errors caused by material accumulation and helps to achieve consistent coating performance. The coating area for the front side is detected using a sensor and fed back to the nozzle position. This value is then used to automatically align the rear side. The valve speed and timing can be controlled with great precision, providing enhanced adjustment of coating thickness formation. Original drying system supports both high quality and productivity. The system effectively combines slit-shaped, high-speed discharge of hot air with rapid suctioning of atmospheric humidity. Together these features keep the humidity of hot air brown above the electrode materials consistently low, achieving extremely quick drying. * Based on our own comparative evaluation, drying times can be reduced by 20%. Transfer speed Max 80 m/min.